PetAssure Review: Is The Affordable Pet Insurance Alternative Legit? If you have pets, you know just how expensive it can be when it’s time to take them to the vet. Whether it’s for routine checkups or a medical emergency, vet bills can add up quickly and can cause financial stress if you’re not prepared. Pets are like family, so it’s important to get them the medical attention they need when something goes wrong. Unfortunately, vet bills can be extremely high, meaning some pet owners can’t afford to give their pets the care they need. Pet Assure is a company that is helping countless pet owners with high vet bills. Rather than traditional pet insurance, Pet Assure provides an automatic 25% discount on all in-house veterinary services that are provided, meaning significant savings for pet owners. Whether you have one pet or multiple, you can take advantage of significant savings through Pet Assure. Here’s our full review to show you the awesome benefits that Pet Assure has to offer. Click here to check out Pet Assure and start saving 25% on your vet bills today! Pet Assure is the industry’s leading veterinary discount plan. All you need to do is present your Pet Assure card to any participating veterinarian to automatically get 25% off of your vet bill, no questions asked. Even if you’re going in for a routine checkup, 25% off your vet bill is significant savings. And unlike insurance, there’s no deductible that you have to hit before the savings kick in. In addition to no annual deductible, there are also no annual limits, so you can use the discount as much as you want throughout the year. Enrolling takes just a few minutes, and for a small monthly fee you can get automatic discounts on your veterinary care. Pet insurance can come with hefty premiums and a large deductible. With Pet Assure, you’re getting automatic discounts on vet services without having any deductible, all for one low monthly fee. Pet Assure is an excellent alternative to pet insurance and can give you the peace of mind that you’ll be able to give your pets the care they need. Once you enroll, you can start using your discount immediately with participating veterinarians. The best part about Pet Assure is that participating veterinarians will give you an automatic 25% discount on all medical services provided in-house, without any restrictions. That’s huge for owners that have pets with chronic or pre-existing conditions, as most insurance companies won’t cover any pre-existing conditions. Better yet, Pet Assure discounts vaccinations and wellness visits, which is a coverage that often costs extra through traditional pet insurance. With Pet Assure providing discounts on all medical services provided by partnering veterinarians, you’ll be able to use the discount on any medical service you need. That can be a huge help when an emergency happens and there are hospitalizations and surgeries involved. Too many pet parents have had to make heartbreaking decisions simply because the costs of veterinary services were too high. With Pet Assure, you’ll be much more prepared to handle vet bills with the automatic 25% discount on all medical services. Pet Assure is the most robust pet discount service available, with all medical services receiving an automatic 25% discount through participating veterinarians. In addition to discounting all medical services, there are no restrictions on age, breed, or even type of pet, meaning every pet in your household can be covered with Pet Assure. There are some services that are not covered under the Pet Assure discount, including boarding and grooming fees, take-home medication, off-site blood and lab work, and food that you purchase through the vet. While medications and food are not covered under Pet Assure, all members receive 15% off medications, preventatives, and food through PetCareRX, so you’ll still be getting some savings on those items just for being a Pet Assure member. Pet Assure offers four distinct packages, meaning you’ll be able to find the perfect package for your needs. The least expensive package is the Single Cat Package, which covers one cat or one small animal. Those animals include, turtles, gerbils, guinea pigs, birds, rabbits, or ferrets, to name a few. This package, like all packages offered by Pet Assure, provides a hefty discount if you pay for a full year at once, so if you’re looking to make the most of your Pet Assure discount, the yearly billing option is the best way to go. Click here to check out Pet Assure and use code SC15 to get a 15% discount on a Single Cat Package! The second package is the Single Dog Package, which covers one dog or one large animal. Large animals include horses, llamas, pigs, or other farm animals. Veterinarian services for large animals can be even more expensive, so having a 25% discount through Pet Assure is a great way to cut back on costs. Click here to check out Pet Assure and use code PASD15 to get a 15% discount on a Single Dog Package! If you have more than one animal, Pet Assure provides a Family option. This is Pet Assure’s most popular option and covers 2 to 4 animals of any size, making this perfect for the typical household. Whether you have all small pets, all large pets, or a combination, you’ll get discounts on up to 4 pets with the Family Package. Click here to check out Pet Assure and use code PAF15 to get a 15% discount on a Family Package! The final package that Pet Assure offers is the Unlimited Package, which covers every pet that you own. If you have 5 or more pets, this is a fantastic way to save on your vet costs. Pet Assure also offers a risk-free guarantee, meaning if you cancel within 45 days of enrolling, you’ll get a full refund. The Pet Assure site provides a thorough chart that covers average vet costs and how much you can save on those costs with Pet Assure. For example, the average wellness visit is $45, meaning you would save $11.50 just on that visit. Another common procedure that you might need to have done for your pets is a dental cleaning, which costs an average of $475. With Pet Assure, you’ll save $118.75 on that visit alone, which can easily be more than the cost of an entire year of Pet Assure depending on the package you choose. 25% off of all medical services can add up fast, especially if you have multiple pets in your household. Pet Assure provides incredible savings, potentially giving pets access to a level of care they weren’t able to get before. 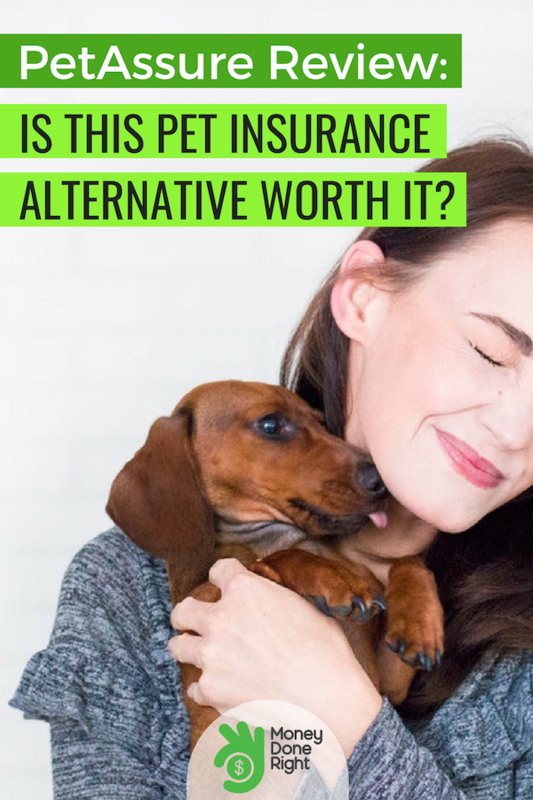 You might be weighing your options between traditional pet insurance and Pet Assure to see which is the better value for your pets. As we have discovered, Pet Assure is a robust discount program that provides a 25% discount on all in-house medical services provided by Pet Assure partners. Traditional pet insurance works very differently than Pet Assure, so we wanted to compare the two so you have the information you need to make the best decision for your pets. Pet insurance has a premium that can typically be paid monthly, quarterly, or yearly, depending on the company. The premium depends on factors such as your deductible, the amount you’ll be reimbursed for covered charges, and any add-ons you want to include. You have a deductible that you have to hit before your pet insurance kicks in, meaning it may be awhile before you start seeing a reduction in your vet bills. Pet Assure lets you start using your 25% discount immediately. With insurance, you also won’t be covered for all medical services. Pre-existing conditions are rarely covered, and you often have to pay a higher premium to have things like vaccinations and wellness exams covered under insurance. While the reimbursement rates are often higher than the 25% discount that you’re getting through Pet Assure, you’ll probably have to pay a lot more for it. With Pet Assure, you won’t have to worry about filling out paperwork, waiting for your claim to be approved, and waiting for your reimbursement. Just show your Pet Assure card to a participating veterinarian and have your discount applied automatically. Not only will you get discounts on medical services, you’ll be able to enroll in Pet Assure’s Lost Pet Recovery Program completely free of charge. Each pet that is on your Pet Assurance plan will be issued a collar tag with a unique ID number. If your pet goes missing, the person that finds your pet just needs to call the toll-free number on the tag and provide the representative with the unique ID found on the tag. Our team will work diligently to get your pet back home to you. That means calling you immediately and reaching out to your emergency contacts if we are not able to contact you. With 1 in 3 pets going missing at some point in their lives, having a plan for when your pet goes missing is important. As we mentioned before, you’ll get a 15% discount on PetCareRX, where you’ll find food, prescriptions, and preventative medications. In addition to the 15% discount on PetCareRX, you’ll also be able to take advantage of $50 toward your first pet sitting, boarding, or walking reservation through Rover. These two discounts are great ways to save even more money on your pet care so you can give them the life they deserve. All you need is your Pet Assure ID number to start taking advantage of these savings today. Enrolling in Pet Assure is an incredibly simple process and takes just a few minutes. You’ll fill out a short form to get your pet or pets enrolled, where you’ll enter their information, pick your package, and complete your registration. You’ll then be able to take your Pet Assure ID card to any veterinarian that is in the Pet Assure network. When you present your card at the vet, you’ll get an automatic 25% discount on all in-house medical services provided. There are no lengthy forms, no claims to submit, and no more having to wait weeks for reimbursement like you would with pet insurance. When you look at typical costs for vet services and what you’ll be saving with Pet Assure, it’s more than worth it. In fact, Pet Assure can easily pay for itself in just a few visits. This program is the top vet discount plan available because it covers all in-house medical services and partners with thousands of veterinarians across the United States. With one low monthly fee, you’ll get automatic discounts, help when your pet is lost, and additional discounts on products and services through PetCareRX and Rover. When something happens to your pets, it can put a strain on your finances if you’re not prepared. Even if it’s not an emergency, vet costs can really add up. Pet Assure is a fantastic way to drastically reduce your vet costs and provide you the peace of mind that your pets are going to get the care they need, when they need it. With an automatic 25% discount on all in-house medical services with partner veterinarians, Pet Assure is an incredible value for the low monthly cost. Don’t leave your pets unprotected, sign up for Pet Assure today.